When I moved from Texas into my two bedroom apartment here in Illinois, I realized I had almost no furniture. Without most of the essentials – kitchen table, couch, and dresser – I felt lost. I had a TV but no place to sit, food but nowhere to eat it and clothes piled up without a dresser. During the course of the last few months, I became obsessed with putting together a list and finding these items for my new place. Before things got too out of hand – I made sure to put some stipulations on myself. The first stipulation was that they had to be affordable (<$150 per piece). I also made sure that the furniture I would be buying was durable. In addition to these things, they had to be tasteful and fit in with my contemporary modern style. Given all these stipulations, needless to say – it was quite a difficult task! 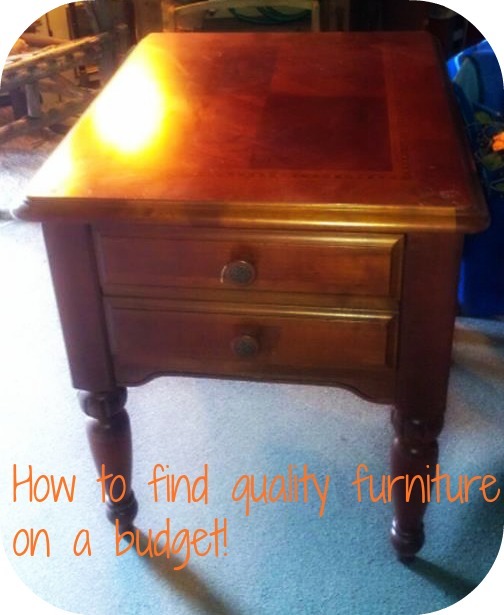 Quality – After purchasing a pair of crummy couches while in graduate school, (They only lasted a year before both had broken due to terrible construction) I was on a mission for quality pieces of furniture. I started searching every site I could online including Craigslist, Facebook group pages, major stores brands like Kohl's, Wal-Mart and Ikea. I also started going to antique shops nearby. The more comparison shopping I did – the easier it was to spot a quality piece of furniture and make a smart purchase. Cost – One of my biggest stipulations was that each piece of furniture couldn't cost more than $150. As I have a budget to stick to each month, this part was absolutely crucial. Even if I truly loved a piece of furniture – it if was over my $150 limit – I made sure didn't buy it. Over the course of my shopping time frame, one of the best deals I found was a really nice end table for $10 at an antique shop! Though the piece looked like it was worth ten to twenty times that, always keep an eye out for deals - you never know what you will find! Another tip to follow would be when you see a great deal – it is important to make a decision as quickly as possible. Often you are not the first person to see the piece and when it is offered for an excellent price it will not last long! DIY Furniture- Another way I found to keep costs down was purchasing furniture that I had to put together myself. I bought both my dresser and bookshelf from Ikea. In total both cost me $139.98 (without tax) which was a steal from some of the other places I had been looking at. While it did cost me my time to put them together – they were exactly what I needed for the right price and will last me for years to come. Patience – Sometimes waiting for a quality piece of furniture can take some time to find. It also takes time to save the money required to make these purchases. Although I may have found a piece of furniture that I wanted to own, I only wanted to spend $150 each month on furniture. There were times when I saw a piece of furniture I really wanted, I had to be patient with myself and my budget. If I had spent the allotted $150 on the futon, I couldn't buy the TV stand in the same month too. Below is a list of the furniture I bought – and how much I paid for it. Keeping in mind the quality of the furniture I wanted, the cost (>$150), putting some of the furniture together myself and being patient really helped me take my new apartment from a place I rented into what I can now call home.